It was only a couple years ago that I was bemoaning Obama’s failure to fulfill his promise to resolve major confrontations in the world diplomatically. “Smart power,” in the Obama lexicon, had largely been window dressing on the same old exercise of hard power — the widespread drone strikes, the surge in Afghanistan, the intervention in Libya, the Special Forces operations in Africa and elsewhere, the Pentagon’s “pivot” to the Pacific. Obama temporarily neutered the Republicans and won a second term. And now, two years later, he seems to be finally making good on his 2008 campaign promise to extend a diplomatic hand to adversaries willing to palaver. The negotiations with Iran have yielded an interim agreement. Secret talks with Cuba have produced a startling détente. Who knows, perhaps in the next 18 months, some negotiated solution might emerge for the conflict in Syria as well. That would be the diplomatic equivalent of winning the horse racing’s Triple Crown. The drone strikes continue. And so have the more conventional attacks on the Islamic State. The Pentagon hasn’t given up on its plans for the Pacific. But this is not surprising. After all, as the president has repeatedly reminded us, not least during his acceptance speech for the Nobel Peace Prize, he is no peacenik. Still, the president has distanced himself from major aspects of the George W. Bush era and taken some considerable risks that he might have shied away from if he were up again for reelection. The question at this point is not just what will happen to these fragile victories during the remainder of the Obama term. Or whether the president can achieve the elusive Triple Crown. The greater challenge, as I listen now to the sound of knives sharpening against whetstones, is this: Can this commitment to diplomatic solutions survive beyond 2016? There was no greater visual symbol of the new Obama persona of diplomat-in-chief than the photo op at the recent Summit of the Americas in Panama City. 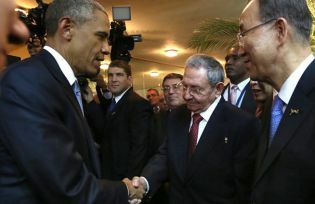 The U.S. president shook hands with Cuban leader Raul Castro, and the two agreed that the long war of enmity between the two countries was over. There are now direct flights between the United States and Cuba, and even Airbnb has set up on the island. President Obama’s popularity rating in Cuba, at 80 percent, is not only much higher than the level he enjoys at home but also much higher than that of either of the two Castro brothers. Even though the two countries are scheduled to exchange ambassadors, the United States maintains an embargo against Cuba. President Obama has the authority to ease certain sanctions against the country, but only Congress retains the power to maintain or lift the embargo that’s been in place for more than 50 years. And so far, the Republican-controlled Congress isn’t budging. Meanwhile, all nine Republican presidential candidates pledged at an agricultural summit in Iowa to keep the embargo in place until Cuba makes more substantial political changes. But what will probably change first is Congress. After all, there’s a powerful force pushing against congressional resistance: the U.S. business community. Last month, the largest-ever U.S. delegation visited to the island. Sponsored by the agricultural lobbies, the delegation brought together 95 representatives from a dozen states, including two former secretaries of agriculture. U.S. agribusiness can send grain and meat to the island. But they also want to export farm machinery and enlist the U.S. government’s help to promote exports. Some foreign policy developments, despite pockets of resistance, acquire a certain air of inevitability. Détente with China in the 1970s raised the hackles of diehard anti-Communists in the United States. But the prospect of a billion Coke drinkers and Oreo consumers was too attractive to the U.S. business community. Profit trumped ideology. With Cuba, Obama is counting on a similar momentum to push forward his policy of engagement. He’s done what he can at an executive level, even removing Cuba from the terrorism list this week. It’s now up to the business community to maintain a full court press on congressional representatives, regardless of party affiliation, to perceive the economic benefits of ending the cold war with Cuba. With Iran, the task will be much harder. Congress is frankly irrational on the subject. Several senators insisted that a vote on the final deal was needed so Congress could fulfill its constitutional duties. But there is no constitutional imperative requiring Congress to insert itself into the negotiations, which are the only effective means to block Iran from developing a nuclear weapon. Any final agreement would be a political agreement, which Obama administration officials say does not require congressional action, and it would not be a legally binding document. It would not be a formal treaty, which requires Senate ratification. Moreover, congressional opposition to the preliminary agreement that came out of Lausanne, as The Washington Post’s Dana Milbank has pointedly written, is contradictory to say the least: Lindsey Graham (R-SC), for instance, is promoting as an alternative to the Lausanne agreement the very 2013 pact that he denounced at the time. The Iran hawks are not interested in a better deal, despite what Tom Cotton (R-AR) and Benjamin Netanyahu (R-IS) maintain. They don’t want any deal at all. More importantly, they want to lop off Obama’s legacy at the knees. If the stakes weren’t so high — we’re talking war and peace — then this would be the stuff of satire. But here, too, Obama is calculating that a successfully concluded agreement at the end of June will compel Congress to go along. “You can’t argue with success,” as the saying goes, and an effectively frozen Iranian nuclear program is something that even skeptics like non-proliferation expert Gary Samore and media firebrand Bill O’Reilly have acknowledged would be a step forward. But all of that is happening on Obama’s watch. What happens when Obama is no longer in the White House? When the outgoing president sat down with the incoming president in early 2009, George W. Bush asked Barack Obama to preserve two of his key foreign policies: drone strikes and the secret cyber-attacks on Iran’s nuclear facilities. Imagine a similar scene in early 2017 when Obama is passing the baton to his successor. Will he make a similar plea to maintain a consistent U.S. policy on Iran and Cuba? And will his successor listen? The Republican candidates have given every indication that they will try to rewind as much of the Obama presidency that they can. They’ve uniformly rejected détente with Cuba. And they’re generally united on the question of Iran as well. Hillary Clinton also announced her candidacy this week. On Iran, she has generally supported the president’s position, even though that has placed in her opposition to some of the leading lights of the Democratic Party, including future minority leader Charles Schumer (D-NY). She came out against the letter that the 47 Republican samurai sent to the Iranian leadership, and she has expressed strong backing for the Lausanne deal. This is not really surprising. Clinton can’t oppose such a high-profile deal without standing against many of her former State Department colleagues. And it makes political sense for her to distinguish her foreign policy positions from her Republican opponents, as long as the Iran deal seems to be heading toward success. But in other respects, Clinton has indicated that she too would rewind the Obama presidency — not all the way back to the Bush years, but at least to the more muscular brand of international affairs that she promoted as secretary of state. She won’t win the presidency as a mere extension of the Obama brand. On foreign policy, she is much more likely to diverge from the Obama record by turning right rather than left. With Obama considered a softy on national security matters and his diplomatic achievements derided by hardliners as a “train wreck,” Clinton is widely perceived as “more hawkish and authoritative,” as the centrist Third Way concluded from its recent focus groups. She will likely use a good deal of aggressive language and do her fair share of saber-rattling, as she did in an interview with The Atlantic last year, in order to appeal to independents and peel away some Republicans. She has to run against her typecasting — as a Democrat, a member of the Obama cohort, and a woman — in order to prove to the average voter that she can stand toe to toe against the likes of Vladimir Putin. Between the full rewind offered by the Republicans and the half-rewind of Hillary Clinton, what likelihood does Obama’s diplomatic legacy have of surviving even a few weeks into the next presidency? It’s remotely possible that a dark horse candidate with a deeper commitment to diplomacy — former Republican Lincoln Chafee, for example, has criticized Clinton’s “top-down American muscular approach” — might come out of nowhere to grab the Democratic nomination. It’s also conceivable that Clinton, with enough pressure from advisors and the grassroots, could turn left instead of right on foreign policy. But I wouldn’t count on either of these possibilities. Still, President Obama has nearly two years to make the rapprochements with Iran and Cuba irreversible. If he can do that, and bring about a ceasefire in Syria to boot, then his diplomatic legacy will be secure — no matter what his successor does to reassert the worst kind of dumb power.